A recent performance put professional string players on par with blue jeans and backpacks and high school hooded sweatshirts. Pure sound coasts out of two violins, a viola, and a cello. Teenagers sit feet away as the Dakota String Quartet shifts tempos and moves with the music. They perform in Lincoln High School’s orchestra room, and these professional musicians don’t leave to the sound of applause. Instead they insist on instruction. "Sometimes I ask kids, ‘Why do we practice? Do you know the main purpose of practicing?’ And they say, ‘To make perfect’ or ‘to be better’ or so. And truly the main purpose of practicing is to make easy," Magdalena Modzewlewska says. Modzewlewska is principal second violin in the South Dakota Symphony Orchestra. When she talks with high high school students, she rests her instrument beneath her chin - stressing comfort and minimizing effort. She coaches violin fundamentals so students are poised to perform music well beyond their rudimentary skillsets. 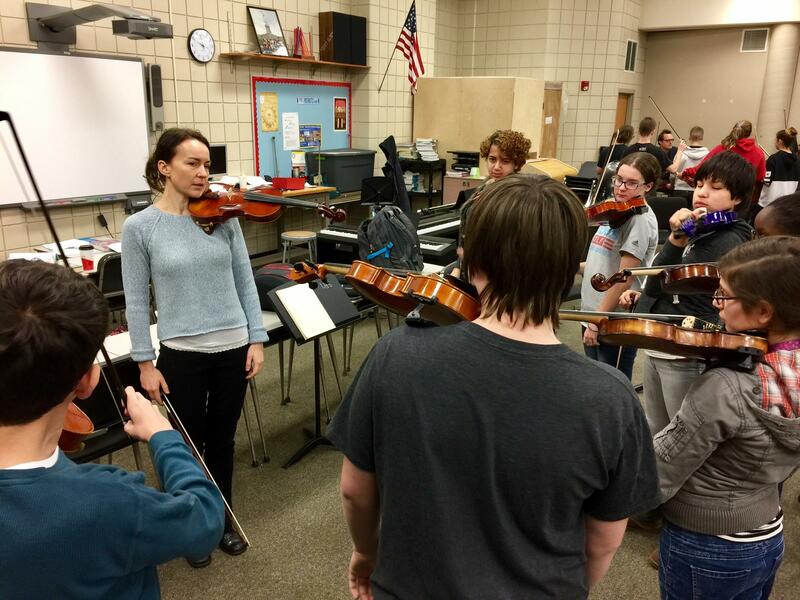 Maggie Modzewlewska shows Lincoln High School students how to position their violins. "Very often the idea of a master class has to do with just reinforcing what the teacher is doing, because the teacher is saying things all the time, over and over," Modzewlewska says. Mario Chiarello is orchestra director at Lincoln High School. 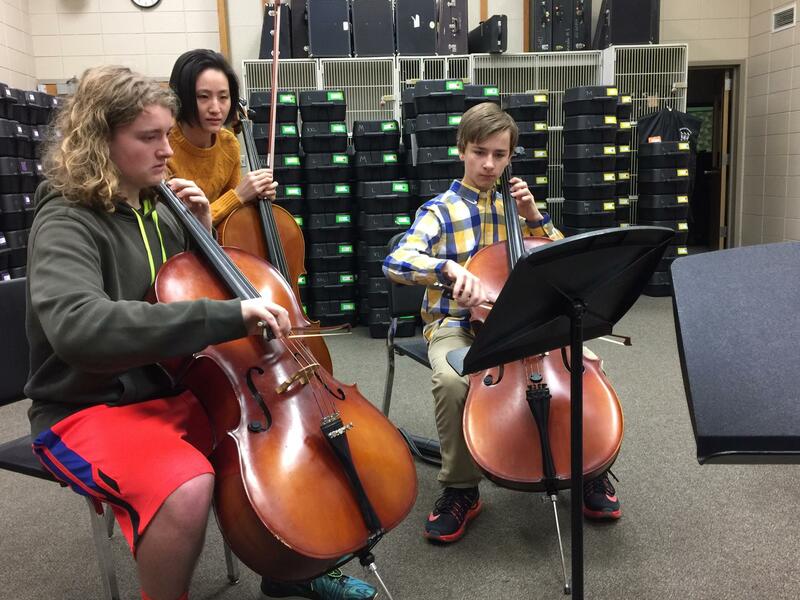 "My freshman cello section had their shoulders up and were playing extremely pronated, and I had been trying to get them down so that the weight would fall through the arm and into the cello. She went up to one kid and pushed their shoulder backwards and everything dropped into line," Chiarello says. "From there, one kids saw her do that and they saw the difference it made in the first kid, and every other kid did it, and it was shocking the difference. And I’ve been doing similar things, but when Jia [Cao] comes in, every kid listened to her, and it fell right into place right away." Chiarello calls himself a "good" musician. He’d better be; Chiarello is principal base in the South Dakota Symphony Orchestra. In class, he’s playing and teaching students who wield many instruments that are not his specialty. He says that’s one benefit to a visit from other strings. SDSO cellist Jia Cao assists students working on music. "So when the quartet comes, I have five pairs of eyes looking at these guys," Chiarello says. 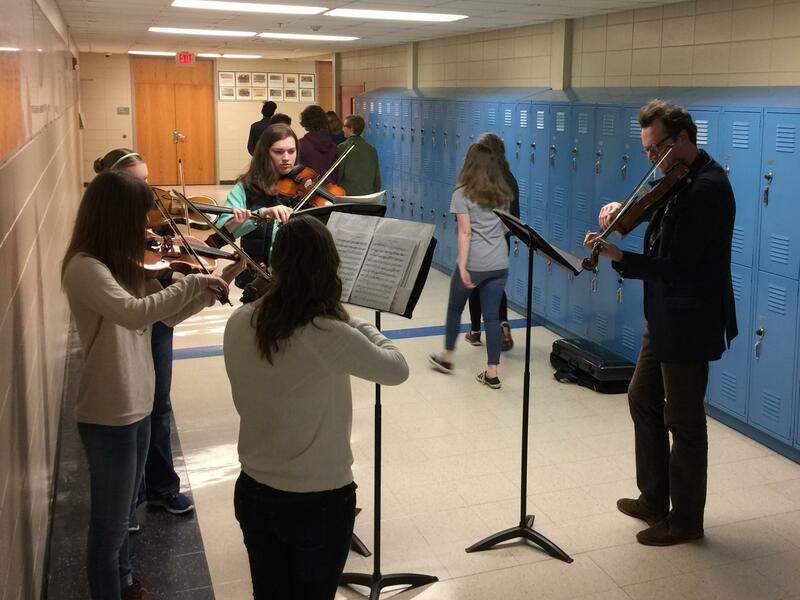 Advanced orchestra students receive a rare opportunity to practice with members of the quartet. "When the members of the quartet got here, we kind of just break up into sectionals so first violins, second violins, violas, and cellos all go with their separate coach," Gillian Hilscher says. Hilscher plays the viola. She’s careful not to disparage the other strings when she gushes about the pieces written for her instrument. "A lot of it’s newer, because a long time ago most solos weren’t written for viola. It was like violin or other wind instruments or something, so I think a lot of the solos are cool," Hilscher says. "Plus it’s just a lot more mellow than the violin, sometimes. I mean, violin is pretty, but it can get like really high and stuff. I just like the viola because of its sound. It’s warmer, mellower, and just blends in with the orchestra." Hilscher says she’s not much into sports, but she likens working with the South Dakota Symphony Orchestra’s principal violist as teaming up with an NFL coach. "Once you hear that, you've got to be affected by it." "It’s pretty cool. Yeah, because, I mean, not many people to get to – it’s pretty much just like a lesson. You don’t get to have a lesson with the first chair of the section in the South Dakota Symphony. It’s kind of a big deal," Gillian says. "I’ve learned just a lot of just different things about musicality and how to make just phrasing. And also his big thing is to start from the string so you get a clean sound and smooth." Hilscher says she knows the notes are important, but she says she’s embracing the concept that music is meant to be felt. It’s an experience. "The joy I find in it is playing it, but also I think listening to it can open up – you can see like into the past, pretty much, because these pieces were written by people who lived a long time ago, and so it’s kind of like a little window into their world," Hilscher says. Hilscher and her classmates are learning a familiar – advanced – piece. SDSO Principal violist Aaron Tubergen implores the young musicians to consider its context. "The story of Romeo and Juliet obviously is, you know – there’s a lot going on. And it’s also written by Tchaikovsky who is kind of the peak of romantic music in a lot of ways in just beautiful melodies," Tubergen says. "So being able to kind of play up some of that once again for the audience, to whoever’s eventually going to hear them, for their parents coming to the concert. As much kind of detail as you can put into the music I think is good." Violist Aaron Tubergen walks violists through their music in a sectional. Tubergen acts as a human metronome and listens to the students play. Then he’s uses his own instrument to validate the lesson. "I’m a big believer in always being able to demonstrate stuff. I think it’s really hard to be a great teacher if you’re not a really great player," Tubergen says. Tubergen doesn’t have grand violist-teaching dreams. He says his hopes for an in-school residency are reasonable: coaxing budding viola players to be a little bit better than they were. "If they remember that in 40 years, great. If they remember it in two years, that’s great, too!" he says. Tubergen says he sees evidence that the Dakota String Quartet’s guidance affects students. Young people show up at performances. 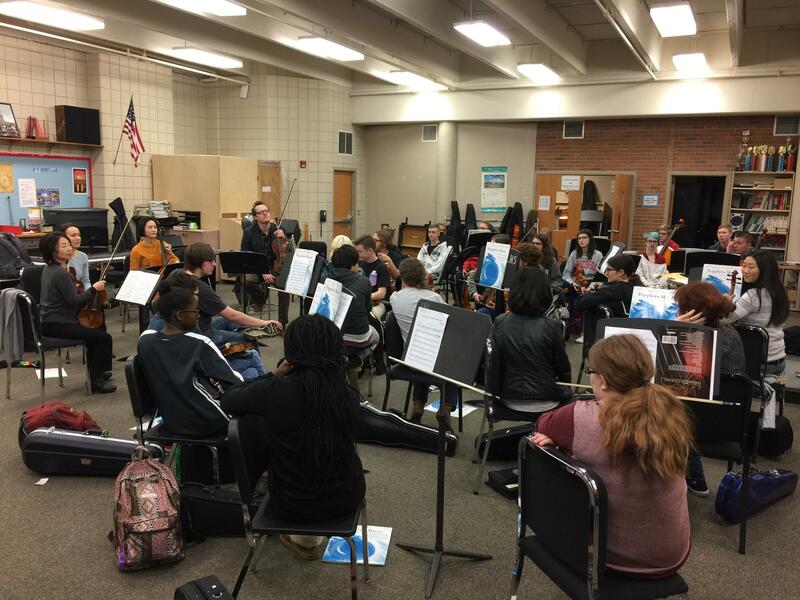 "Some of the kids – I feel kind of bad – but some of them will wave to me at orchestra concerts like in the front row. I’m like, ‘Oh, I recognize you, but I forgot your name. I’m so sorry!’ So when I show up to their school, I have to politely ask them to reintroduce themselves," Tubergen says. Violinist Violinist Maggie Modzewlewska says young people bring an energy to SDSO concerts. "They’re still learning. They’re taking it in. It’s exciting in that way. They don’t know everything yet. They don’t just come to relax and enjoy it. They come to almost actively participate and actively get something that changes them. You know, it’s very different in a 16-year-old than a 65-year-old coming, because they’re at a different stage of their life," Modzewlewska says. "It affects them – and it affects us differently. The communication for the player is not just this way. It’s this way, too. It’s both ways. So what we feel for the audience also fuels us up and we play in a certain way – differently, too, because of that." Modzewlewska says she appreciates concerts with herds of lively, rowdy kids – her words. She emphasizes that most students she encounters will not follow her professional path. Modzewlewska says achieving high marks on the violin isn’t necessarily the point. Her perspective is that training in music builds character. 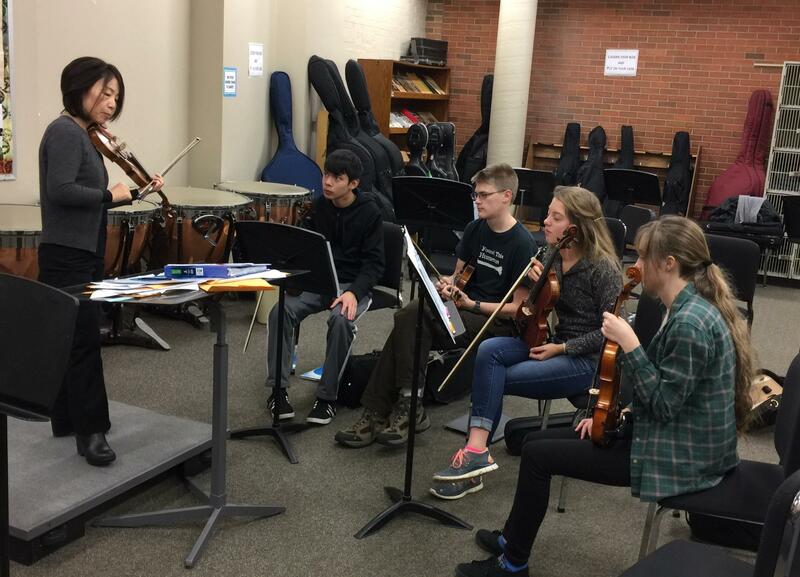 SDSO concertmaster and violinist Doosook Kim instructs students at LHS in Sioux Falls. "Whether it’s holding the bow and trying to do your best and feeling your muscles to have control, self-control. Right? You think about more broader aspects of it, so, yes, self-control here, self-discipline. Think first. Do second. How useful it is when you are studying medicine, maybe, or anything else," Modzewlewska says. Members of the quartet and their students toss around this word “musicality.” They say it’s the result of transforming a rubric written on the staff into art. Gillian Hilscher is a high school sophomore. "You feel kind of more immersed in the music, I guess. You get kind of lost in the beauty of it. But also it just makes it fun as an audience to listen to it," Hilscher says. "Something like that instead of something measured out so strictly isn’t as fun to listen to as something that’s just like really beautiful and from the heart." Hilscher is listening to her mentors. Orchestra director Mario Chiarello says real music moves both the audience and the musician. "My first violin section are all really good players and can play all of the notes, but they don’t understand the power that has to come out of it," Chiarello says. "And when Doosook [Kim], the explosion of sound that comes out of Doosook’s violin, once you hear that, you’ve got to be affected by it." Chiarello says that’s the extraordinary opportunity his pupils receive when symphony and schools synthesize. The Dakota String Quartet musicians answer questions from high school students in Sioux Falls. It’s Christmas Eve. Time for last-minute shopping, final gift-wrapping and 11th-hour preparations for celebrations that lie ahead. Through it all, we hear music – at home, at work, in shopping malls and even on the streets. And though popular standards by crooners from Frank Sinatra to Harry Connick may fill the air, traditional songs can also be heard – frequently played by symphony orchestras.